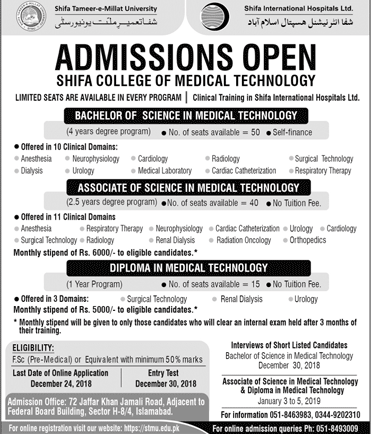 Shifa College Of Medical Technology Admission 2018 open and those students who wants to get admission here, they should apply here and get seat on merit. 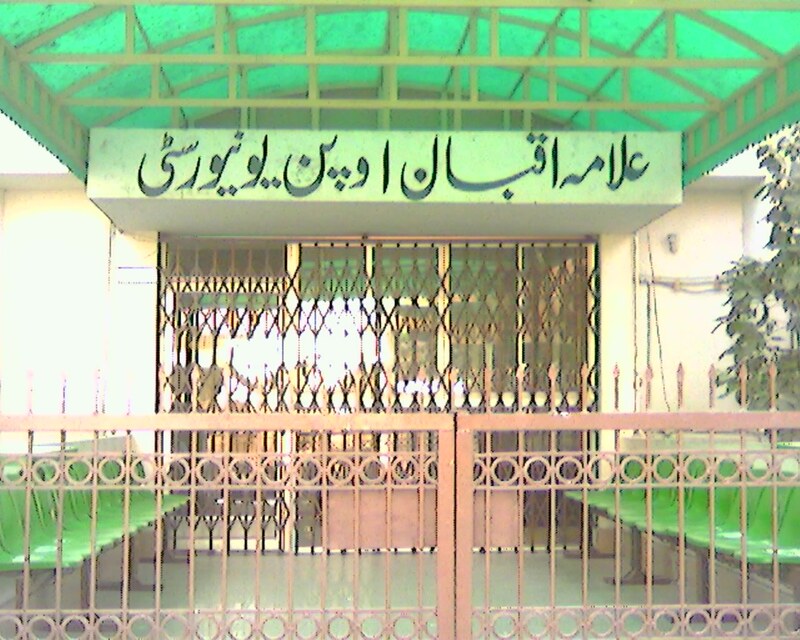 Shifa College of Medical Technology (SCMT) is a constituent college of Shifa Tameer-e-Millat University & is unique in its approach to healthcare education in the field of medical technology. SCMT aims to become an innovative center dedicated in bringing highly specialized medical technologists who assist healthcare professionals in treatment, diagnosis, monitoring & prevention of diseases. 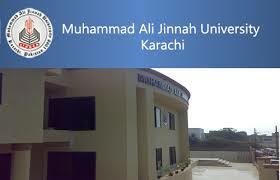 It is Located in the educational hub of Islamabad. Shifa International Hospital accommodates our trainees in a rigorous clinical training that aims to produce well rounded healthcare professionals who perform to the best of their ability. SCMT is unmatched in its delivery of educational services as we offer a degree in ten different specialties of medical technology. The Clinical training in Shifa International hospitals Ltd has the following programs like bachelor of sciences in medical technology which is 4 years degree programs. The associate of science in medical technology is the 2.5 years degree program with 40 no of seats available with no tuition fee. The 50 no of seats are available on self finance basis. SCMT is unmatched in its delivery of educational services as we offer a degree in ten different specialties of medical technology. If you want to get admission here then you should apply on time. 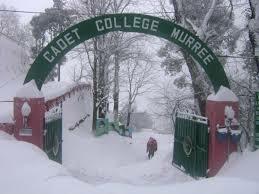 Only those candidates get admission here who are eligible. Shifa International Hospital accommodates our trainees in a rigorous clinical training that aims to produce well rounded healthcare professionals who perform to the best of their ability. 60 percent overall score in pre-medical group of Intermediate Certification in Pakistan. US Grade-12 Diploma (minimum GPA 3.0) accompanied by an Equivalence Certificate from the IBCC of at least 60 % F.Sc pre-medical qualification. A-Level Certification with Chemistry, Biology & Physics or Mathematics. The achievements should be over 60% (pre-medical) in IBCC Equivalence Certificate. You can download all application form online free from here. After appling online, you should buy prospectus from university and fullfill other requirements of university. Address: Plot No. 72, Adjacent to FBISE Building, Jaffar Khan Jamali road, Sector H-8/4, Islamabad.